Starting out with Bible journaling doesn’t have to be expensive when you use free digital Bible Journaling templates.Often times these freebies are traceable without graphite paper because Bible pages are so thin. If you don’t have a Bible yet or want to know what we use, you view our Bible journaling supply recommendations and our free classes. Here are my favorite sites for free Bible journaling templates. I’ll keep adding to this list, so leave a comment below if there’s a new site or an old favorite that I’ve missed. Don’t forget to leave a comment or share this list with a friend. It helps us tremendously! These are our favorite sites because you get a Bible Journaling template at least every month, but often times more than that! 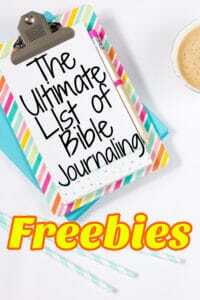 Bible Journaling Ministries – We provide a monthly freebie via email and have many fun things to share with you! Illustrated Faith – This link will get you the current card freebies that you can use for tip-ins or traceables. Sign up for their list to be notified when they release new digital freebies. Bible Journaling Digitally – This link will get you the current digital freebies. However, we’re not fans of the site used to distribute the files. Just be certain you click the right link and ignore the many pop-ups. Documented Faith – This page includes all of the downloadable templates for an entire year that were sent out via email. Be sure to sign up for their list to get more. Bible Journaling with Kids – Resources for the little ones! Faith in heART – Has plenty of digital freebies for bible journaling on this page. No opt-in required. Not Consumed – This page has a few functional collections that are great for bible journaling and time spent in the Word. Rebekah Jones – Free templates, challenges and courses. Pitter and Glink – Free bible journaling cards that are super cute. My Embraced Grace – Super cute print and cut file. There are other free digital files as well. 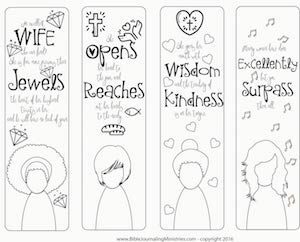 Kinda Wonderful – Printable Bible journaling stickers. My Messy Bible – Many margin strip downloads. Just drag them to your mac or right-click to save the image to your desktop. Pretty Things For You – Free set of scripture printable tags. Karla Dornacher – Free Bible Journaling templates that are coloring pages. Heather Greenwood – Free cut files and journal templates. Kimberly Geswein – Free Bible verse decor. Banielle Burkleo – Bible journaling verses to print and tip-in. Yellow Bliss Road – Multiple printables including notes, scripture, calendars and planners. Jones Design – Pretty table cards and decorations. Spell Out Loud – Printable coloring pages. A Work of Heart – Printable Bible journaling template for the margin of your Bible. Alison Kimball – Printable Bible journaling templates. JoDitt Designs – Printable Bible journaling template library. Paper Smooches – Super cute animals and whimsical digital stamps. Bug a Boo – Cute digital stamps. We’ve been using them in scrapbooking and card making for years. Just Ink Lined – Great selection of digital stamps freebies. Craft Berry Bush – Free calendar and watercolor printables. Tiddly Inks – Free digital stamps on this page, plus some that you can purchase. Dearie Dolls – Dearie doll digital stamps. Sliekje Digi Stamps – Great freebies here and there for personal use only. Two Paper Divas – Cute digital stamps. Doodle Dragon Studios – We love this artist. There’s only one freebie on this page, but we couldn’t help but share. Operation Write Home – Has a great number of free digital stamps. We also love their mission and what they do for our military. There are other sites that provide digital freebies for free, but unfortunately we can’t recommend them because the ads sometimes look like download buttons. It’s way to confusing and can be messy to find and navigate. There’s nothing worse than trying to get a free digital file only to find out that you’ve downloaded a virus or something you didn’t want on your computer. We’ve tested and used the sites we’ve recommended in this list and recommend them. But, if you see that a link is out of date, just let us know in the comments below so we can get it fixed. Thank you so much! Don’t forget to our bible journaling templates, tutorials, and tips as soon as they are released! Including our very first release…Proverbs 31. We hope you like them!